An dieser Stelle gab es nach Erscheinen ihrer ersten CD 2006 schon mal ein Interview mit dem Bandleader von Cubanoson Papo Ortega. Dieses Mal habt Ihr die Fragen gestellt - wir haben sie nur an Papo Ortega weitergereicht. Guenter: Versteht ihr Euch als Son-Band? Wie findet Ihr das, wenn die Leute Salsa statt Son auf Eure Musik tanzen? Did you form the band as a pure Son Cubano band? How do you like it when the people are dancing Salsa (instead of Son) to your music? Guenter, my vision of the orchestra is to maintain our music alive and to modernize the Son Cubano into today�s sound. The original Son bands were basically comprised of Tres guitar, bass, minor percussion (maracas or guiro) possibly bongo percussion, a singer(s) and 1 trumpet. I wanted to expand into a larger ensemble, and added a second trumpet, a trombone and the piano, which is my instrument. By virtue of my orchestration and the musicians that are part of this orchestra, I believe I have maintained the Cuban tradition while adding the New York Salsa flavor to Cubanoson orchestra. As far as when people are dancing, whether they are dancing on 1 or 2, or if they don�t know how to dance at all, it means they like Cubanoson�s music, and that is what I enjoy. Dancing is self-expression and while there is technique, style and specific steps, when people get up and dance and enjoy the music before our eyes that is probably the greatest gift the public can give us. Werner (a little bit funny ... not sooo serious:- ): Auf der neuesten CD singen sie in 3 Sprachen. Wann endlich kommt eine CD auf der wenigstens ein song in deutsch gesungen wird? Michael wird sicherlich beim �bersetzen behilflich sein, oder? I hear 3 languages on your new CD ( spanish, english, french ). Did you plan for one of the next CDs some lyrics in German? Werner, I have to tell you that the people of Germany have been absolutely great to us, and singing in German is something I probably want to consider in the future; I don�t know if it has been done yet, but I imagine that it has. I chose French because I have a second home in Quebec, Canada where the predominant language is French. Having studied some French in high school many years ago made it easier for me to learn the language � I only speak a little but am continuing to study. I am very hopeful to perform in Germany and all of Europe one day. With that in mind, I thought that by adding the French language would help us go International and Cubanoson could achieve that goal. Kerstin: Wie seht Ihr die Zukunft der Salsa? Hat sie eine Chance sich zu erhalten oder wird sie irgendwann verdr�ngt, vielleicht vom Reggaeton? How do you think about the future of Salsa? Will this music have the chance to survive? Or will the Salsa be replaced by other music e.g. Reggaeton? I believe that there is a Salsa craze in the world that is just beginning and continues to grow. Salsa is made up of various rhythms, mambo, guaracha, son, cha-cha, etc.., and the difference between these rhythms and Reggaeton / Rap as examples, is that salsa music has musical substance. Not to say that there aren�t great Reggaeton songs, but many songs are demeaning and some even use insulting language and while some people may like it and continue to support it, I believe these styles are part of the up and down cycle of the times that will not be sustained at the levels Salsa music has maintained itself throughout decades. Salsa music is energetic, complete with numerous rhtyhms, pleasing to the listener and fun for the dancers. If you take classical music for example, after centuries we still listen to Bach, Bethoven and Mozart. Why? The music is so complex and beautiful that it has and continues to survive all other music. The African � Cuban based rhythms have just that, complexity, beauty, intrigue that will never die. Toralf: W�rdet ihr gern ein Konzert auf Kuba geben? Do you wish to perform one day in Cuba? Toralf, I would love to perform in Cuba, but more important I would love to study music from Cuban musicians and teachers. There are so many great quality musicians leaving Cuba every day arriving in different countries that it is easy to see the talent, dedication and contribution these musicians bring to different cultures and music styles. Unfortunately, until Cuba becomes a free and democratic country I will not go there. I have family on the island and know first hand the difficulties they face every day. Ann und Carmen ( beide unabh�ngig voneinander mit derselben Frage ): Gibt es ein Konzert in Berlin? Will CUBANOSON come and play in Berlin? Ann and Carmen � I really hope to perform in Berlin soon. We have and continue to work with promoters, in the hopes of bring Cubanoson to Europe. When I see the videos of your clubs and people dancing to our music, it makes me want to get on a plane and go there. Germany is one place I have always wanted to visit, and Berlin seems like an incredibly beautiful city with great dancers. Hopefully Cubanoson will perform in Germany soon with DJ El Rumbero, my great friend Michael Peters. Mario: Wie findet ihr das Salsa - Stimmung im Berlin? Papo, you've seen the video of the Salsa dancers in Berlin ( how they dance after Rumba Nueva ). Did you like the atmosphere? Mario, I only need one word to answer this question my friend, � �Unbelievable.� �Incredible� �Fantastic� �Phenomenal� - Choose any word you like!!!! Mateo: Was macht in deinen Augen, einen "guten" Musiker aus. Was ist dir wichtig an Musikern, mit denen Du zusammen Musik machst? In your opinion: What is a good musician? Which qualities should she/he have? What is important for you when you choose a musician to play music together? Excellent question Mateo. An orchestra is only as good as the dancer, or listener perceives them. A musician is only as good as the music he/she plays. As far as qualities, from an orchestra�s perspective, the most important quality is to make sure that you keep the dancers and listeners in mind. These are the persons who can make an orchestra famous or forgotten. As far as the individual musicians, to be a good musician one must practice every day, and never stop learning. You can always learn from another musician despite his/her level of knowledge. In my orchestra, we are a family of musicians. Their individual levels of commitment and humility are extremely important to me. If I am doing something wrong on stage, I expect that one or more of the others will tell me as I will tell them when something is not right. Communication, especially during a performance is of the utmost importance. 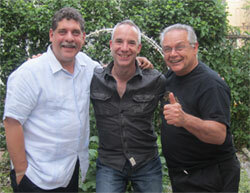 Most of Cubanoson�s musicians have played together for over 20 years in one band or another. But I will tell you, that when Cubanoson gets on stage and starts playing, it is not about the money, its about playing great music, having great fun and getting the people up to dance. Mateo (2): Welchen Musiker in der Geschichte der Salsa verehrst Du? Which musicians in the history do you admire? I admire many musicians. Specifically as a pianist I love Peruchin, Alfredo Valdes, Javier Vasquez and Manolo Albo. The last two I know personally. As far as bands, Celina Gonzalez, Arsenio Rodriguez, Chappottin, Sierra Maestra, Conjunto Casino, Sonora Matancera, Orquesta Aragon, Roberto Torres and Johnny Pacheco. In particular, when you hear my piano solos you can hear Celina's music, in the song arrangements you can hear Chappotin, Casino, and in the swing or momentum of the band you can hear Pacheco and Roberto Torres. When I created this orchestra, and select the repertoire I go back and listen to the great ones for guidance and creativity. Jose: Wer singt den Flamenco background in Rumba Nueva? Ich liebe es. Wie kam es zu dieser Idee? Who is singing the Flamenco Background in Rumba Nueva? I love this. How came this idea? Jose, the flamenco background singer in Rumba Nueva is Jorge �Papito� Sanchez who is one of our newest vocalists for about 2 years now, but has been a personal friend of my family and mine for over 35 years. The idea came from a composer friend Silvio Cebrian and our engineer Guido Diaz. It sounded so great, and different we left it in. Personally, I just love it. Matthias: Was ist f�r Dich der Haupt-Unterschied zwischen Eurer ersten und zweiten CD? In your opinion: What is for you the main difference between the first and second album? Matthias, there are a few differences in Rumba Nueva. In Rumba Nueva I included more original tracks than cover songs, 7 to be exact, whereas in Recordando A Cuba there were 4. In Rumba Nueva, and now on stage, I am the lead singer for all the songs. In the first album I shared the singing in Recordando A Cuba on some songs and only sang harmony on the others. In this album, I sang lead in all 13 tracks. I have to confess that I was a little afraid to do this, as I am not known as a singer, but decided to take the chance. I cannot name any pianist right now who is also a lead vocalist, and thought this could make Cubanoson Orchestra stand out from others. As far as the orchestra, I left the orchestration the same. Since 2005 when we started, I have maintained the instrumentation of 2 trumpets, 1 trombone, 2 percussion, tres and piano, in a conjunto style ensemble. As far as music selection, in Rumba Nueva I did not do a guajira, rather I opted for two cha-cha style songs, Quien Sera/Sway and Histoire D�un Amour. I did this for the dancers. For the other Son Montunos/Guarachas in Rumba Nueva, the speed of these songs (for the hard-core salsa dancers) is a little faster compared to the songs on Recordando A Cuba. While both Cds have their differences, it is my opinion that Rumba Nueva is a more mature CD that grew naturally out of Recordando A Cuba. The orchestra members are more used to performing with each other and new musicians like Trombonist Leonardo Freire have brought great input into the arrangements especially in the creation of brass libs. Junior Rivera on the tres and myself on the piano are more locked in together now than ever. Roberto Rodriguez who is our musical director brought out an arrangement that is nearly 40 years old that had never been recorded in Cubanizate, and like the other musicians, these guys just keep making Cubanoson better and better every day. Lastly, If you were to ask me which one I prefer, I couldn�t decide right now and would have to say both Cds! Andreas: Wo spielt ihr in New York? Ist es schwierig als kubanisch gepr�gtes Orchester in New York? At which locations you're performing in New York? Is it difficult to survive as an Cuban Orchestra in New York? Hi Andreas, many clubs in New York have closed down and there are very few venues left that can accommodate a 9-10 piece orchestra. There is one club in upstate New York, called the West Gate Lounge where we perform 1-2 times a year, and we are in rotation with Salsa bands as well. There are other clubs like Latin Quarter and Club Winner Circle in Long Island where we also have and continue to perform. As far as being a�Cuban� orchestra, that really does not affect us here. I was born in the United States, 5 musicians are from Cuba, 3 are from Puerto Rico and 1 is from Venezuela. I will tell you that it has become very difficult to survive as a band in general, from all genres, Salsa, Merengue and others all face the same challenges of the economy and the lack of venues. Cubanoson has done very well, in my opinion as we do many private events including charities and government festivals and events. THANK YOU ALL FOR YOUR GREAT QUESTIONS - KEEP THEM COMING!